Taylor Branch's "America in the King Years" series is both a biography of Martin Luther King and a history of his age. 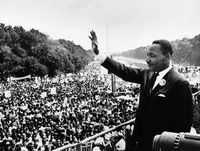 Terry Gross talks with author Taylor Branch, who has written the third in a trilogy of biographies on Martin Luther King Jr. The first book of a formidable three-volume social history, Parting the Waters is more than just a biography of the Rev. Martin Luther King Jr. during the decade preceding his emergence as a national figure. 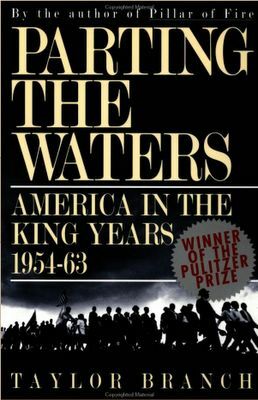 Branch's thousand-page effort, which won the Pulitzer Prize as well as the National Book Critics Circle Award for General Nonfiction, profiles the key players and events that helped shape the American social landscape following World War II but before the civil-rights movement of the 1960s reached its climax. The author then goes a step further, endeavoring to explain how the struggles evolved as they did by probing the influences of the main actors while discussing the manner in which events conspired to create fertile ground for change. 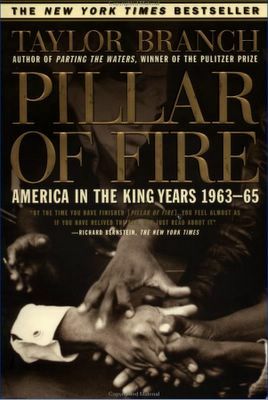 Pillar of Fire is the second volume of Taylor Branch's magisterial three-volume history of America during the life of the Reverend Martin Luther King Jr. 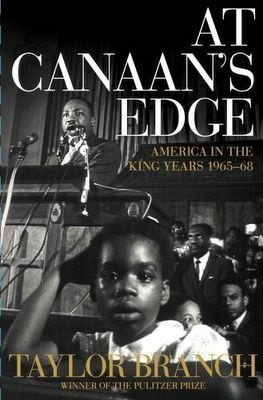 Branch's thesis, as he explains in the introduction, is that "King's life is the best and most important metaphor for American history in the watershed postwar years," but this is not just a biography. Instead it is a work of history, with King at its focal point. The tumultuous years that Branch covers saw the assassination of President John F. Kennedy, the beginnings of American disillusionment with the war in Vietnam, and, of course, the civil rights movement that King led, a movement that transformed America as the nation finally tried to live up to the ideals on which it was founded. King's movement may have been nonviolent, but his times were not, and each of Branch's volumes ends with an assassination: JFK, then Malcolm X, and finally King's murder in Memphis. We know that's where At Canaan's Gate is headed, but it starts with King's last great national success, the marches for voting rights in Selma, Alabama, in 1965. Once again, the violent response to nonviolent protest brought national attention and support to King's cause, and within months his sometime ally Lyndon Johnson was able to push through the Voting Rights Act. But alongside those events, forces were gathering that would pull King's movement apart and threaten his national leadership. The day after Selma's "Bloody Sunday," the first U.S. combat troops arrived in South Vietnam, while five days after the signing of the Voting Rights Act, the Watts riots began in Los Angeles. As the escalating carnage in Vietnam and the frustrating pace of reform at home drove many in the movement, most notably Stokely Carmichael, away from nonviolence, King kept to his most cherished principle and followed where its logic took him: to war protests that broke his alliance with Johnson and to a widening battle against poverty in the North as well as the South that caused both critics and allies to declare his movement unfocused and irrelevant. "After contemplation, I conclude that this award which I receive on behalf of that movement is a profound recognition that nonviolence is the answer to the crucial political and moral question of our time - - the need for man to overcome oppression and violence without resorting to violence and oppression. Civilization and violence are antithetical concepts. Negroes of the United States, following the people of India, have demonstrated that nonviolence is not sterile passivity, but a powerful moral force which makes for social transformation. Sooner or later all the people of the world will have to discover a way to live together in peace, and thereby transform this pending cosmic elegy into a creative psalm of brotherhood, If this is to be achieved, man must evolve for all human conflict a method which rejects revenge, aggression and retaliation. The foundation of such a method is love." The Martin Luther King, Jr. National Historic Site consists of several buildings surrounding Martin Luther King, Jr.'s boyhood home on Auburn Avenue in the Sweet Auburn district of Atlanta, Georgia. Ebenezer Baptist Church, the church where King and his father Martin Luther King, Sr. pastored, is also part of the National Historic Site. Although the Baptist congregation moved to a new sactuary across the street, the historic church is used occasionally for services and special events. The area was designated a National Historic Landmark district on May 5, 1977. The site became a National Historic Site on October 10, 1980 and is administered by the National Park Service. In total, the buildings included in the park make up 39 acres (158,000 m²). The visitor's center contains a museum that chronicles the American Civil Rights Movement and King's role in the movement. Fire Station No. 6, a firehouse built in 1894, contains a gift shop and an exhibit on desegregation in the Atlanta Fire Department. The King Center is the official, living memorial dedicated to the advancement of the legacy of Dr. Martin Luther King, Jr., leader of America’s greatest nonviolent movement for justice, equality and peace. The King Center Develops and disseminates programs that educate the world about Dr. King’s philosophy and methods of nonviolence, human relations, service to mankind, and related teachings.